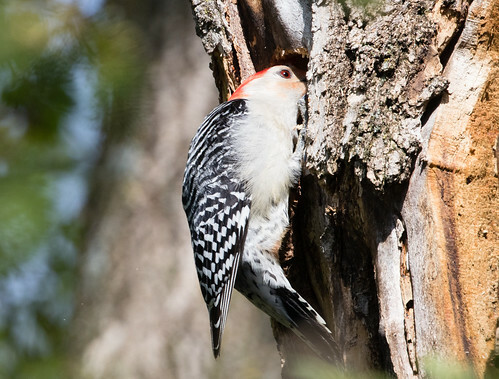 Laura's Birding Blog: Woodpecker City! My corner of Peabody Street seems to have become Woodpecker City this year. Last year I had two pairs each of Hairy and Downy Woodpeckers nesting somewhere near. I’m only regularly seeing one pair of each this year. I know both species are feeding nestlings now because I’ve seen the parents carrying large grubs. They don’t feed their young suet or seeds, so they only visit the feeder during breaks when they want a quick meal for themselves. They’ve stopped calling almost entirely—an excellent sign that they have more pressing issues on their mind. Ryan Brady, one of the best birders I know, did the Great Wisconsin Birdathon Big Day on May 24, and his team saw 158 species, including a Loggerhead Shrike, Yellow Rail, 2 singing male Kirtland’s Warblers, Northern Saw-whet Owl, and White-winged Scoter, but they got skunked on Downy Woodpecker. People seem mystified that this extremely common bird is so often missed on Big Days in May, but that’s because the best days of migration for the best birding coincide so precisely with when Downy and Hairy Woodpeckers are busy with nestlings. By the way, Ryan Brady’s Big Day was a fundraiser for the Natural Resources Foundation of Wisconsin, which plays an increasingly essential role in protecting non-game species as the state reduces support. Learn more about it at wisconservation.org. 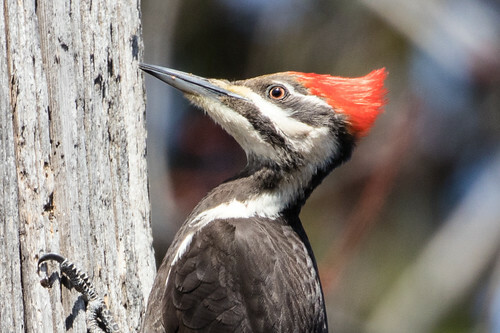 A pair of Pileated Woodpeckers is nesting somewhere near my house. 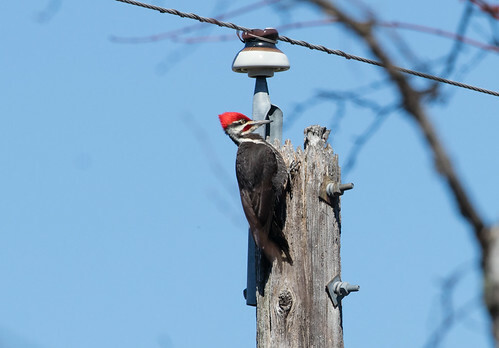 Both the male and female spent a lot of time in March and April yelling and hammering out their territorial proclamations on the power poles behind my yard and my neighbor’s. In the past couple of weeks they’ve been very quiet. It’s possible they’ve moved on, but much more likely that they’re nesting. Flickers have also been calling a lot, but aren’t spending much time right in my own yard. 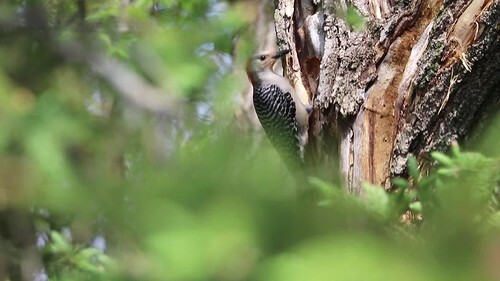 Most unexpectedly, a pair of Red-bellied Woodpeckers have been digging out a nest in the maple tree right next to my driveway. I can’t see them from my upstairs office window, but the digging sounds filter in from sunrise till sunset. After it dawned on me what they were up to, I went onto the roof of our front porch, and it turns out I have a perfect view from there, so I got photos and videos. I know Red-bellieds nested somewhere in the neighborhood last year because last September, a family with adults and young turned up in my yard. 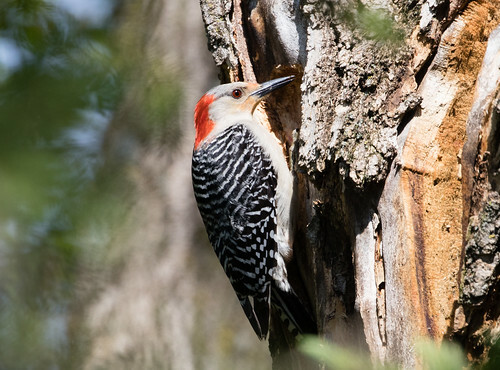 When we moved here in 1981, Red-bellied Woodpeckers were a hotline bird—the first time I had one at my feeder, that first winter, I called Kim Eckert and before I could even get out the final syllables of Red-bellied Woodpecker I heard the phone click. Minutes later, there was Kim on the front porch. 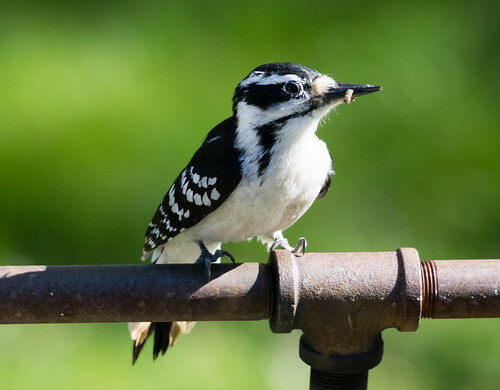 Sadly, the woodpecker had already flown the coop, so Kim had to wait a few months longer to add it to his St. Louis County list. Now they’re quite regular up here, but nesting is relatively new, and a pair actually nesting in my own backyard is cosmically thrilling. Unfortunately, I’ll be gone to Maine from May 28 through June 15, so won’t be able to see for myself whether they give up or finish constructing the nest and start producing and incubating eggs. Once the nest is finished, it’ll take a few days to a week for the female to lay a full clutch, and then the pair will take 12 days to incubate them. By then I’ll be home, anxious to find out if this wonderful pair is really and truly going to produce babies in my very own maple tree. I love going on adventures, and I love coming home again. This time, there will be extra excitement in my homecoming.